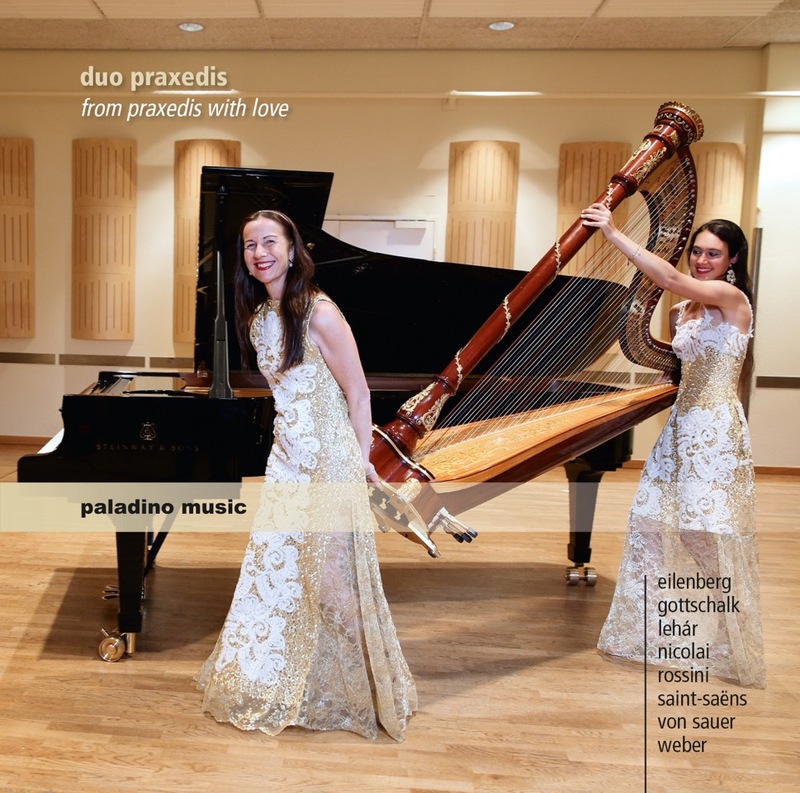 The Swiss mother and daughter Duo Praxedis (Praxedis Hug-Rütti - harp, Praxedis Genevieve Hug - piano) explore music for harp and piano duo. Their previous disc on Paladino Music gave us early classical pieces written for this particular combination. The later 19th century is less fruitful for this repertoire, even though both instruments were popular individually. So on this new disc From Praxedis with Love we have the duos own arrangements of overtures and encore items by Gioacchino Rossini, Camille Saint-Saëns, Carl Maria von Weber, Otto Nicolai, Richard Eilenberg, Franz Lehár, Louis Moreau Gottschalk, and Emil Sauer. This is the duo's seventh disc (and pianist Praxedis Hug has her own solo discs including an impressive Liszt set on Sony, see my review). The problem with the previous disc was that the music, though extremely charming, rather lacked substance. But here, they have chosen a group of substantial works, of the type which were commonly arranged for domestic consumption in the 19th century. They open with the overture to Rossini's opera William Tell, and immediately the advantage of using piano and harp, rather than piano duet, becomes apparent with the range of colours and textures that the two performers find in the music. The result is a surprisingly successful arrangement, and one which totally delights. The remainder of the disc is the same, Otto Nicolai's overture to Die Lustigen Weiber von Windsor and Weber's overture to Oberon both have the requisite combination of lightness and charm, with some nicely sophisticated tonal colouring. Richard Eilenberg's galop Petersburger Schlittenfahrt is pure candyfloss, but delightful and it certainly does not outstay its welcome. Whilst the Ballsirenen-Walzer from Lehar's Die lustige Witwe will put a smile on your face. More candyfloss with Emil von Sauer's Spieluhr and then two pieces from Saint-Saens Samson et Dalila though here the lightness and transparency which worked in the earlier items rather makes the Bacchanale seem a little too fairy like. We finish with another delight, Louis Moreau Gottschalk's Ojos criollos, Op. 37. The performances are sparkling, and the two obviously have a good rapport. So this is the perfect disc to put on, relax, and simply enjoy. Undemanding perhaps, but a total delight.